A little south of the westbound Marion Street Bridge is the eastbound Center Street Bridge. This is a steel plate girder bridge on hammerhead bents that was the third bridge built at this site. 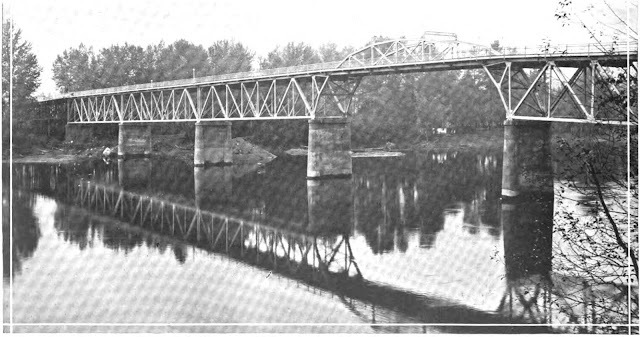 A steel girder bridge was built in 1891 and replaced by a truss bridge in 1918, which was replaced by the current bridge in 1984 (after the Marion Street Bridge was widened to 4 lanes). The approaches were replaced in 1953. 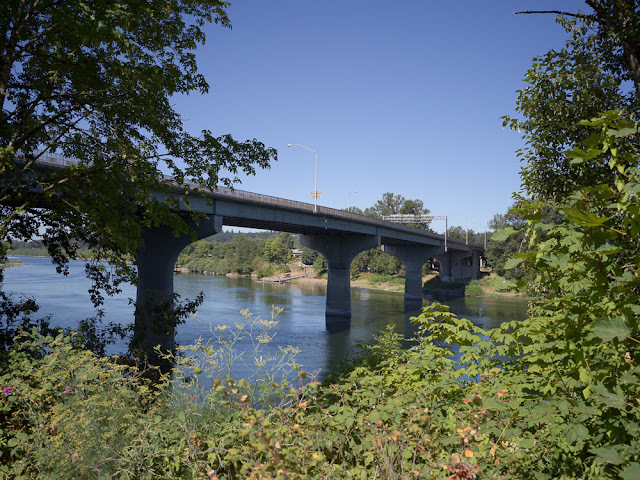 The previous structure was a deck truss bridge with a 156' long truss arch main span (the Bridgehunter calls it a cantilevered double intersecting polygonal Warren post truss span). The Center Street Bridge carried two directions of traffic until the Marion Street Bridge was built in 1952. 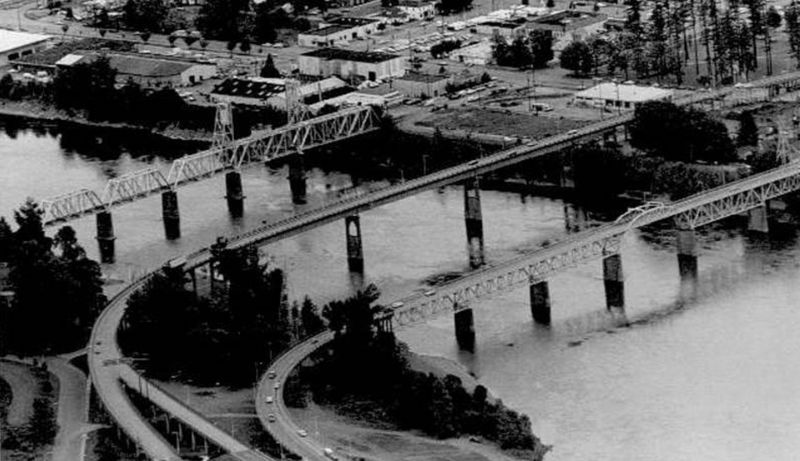 In the photo above (Courtesy of the Oregon Historic Photograph Collection) we see all three bridges (the Union Street Railroad Bridge, the Marion Street Highway Bridge, and the Center Street Highway Bridge) in the period before the Marion Street Bridge was widened and the old Center Street Bridge was torn down. 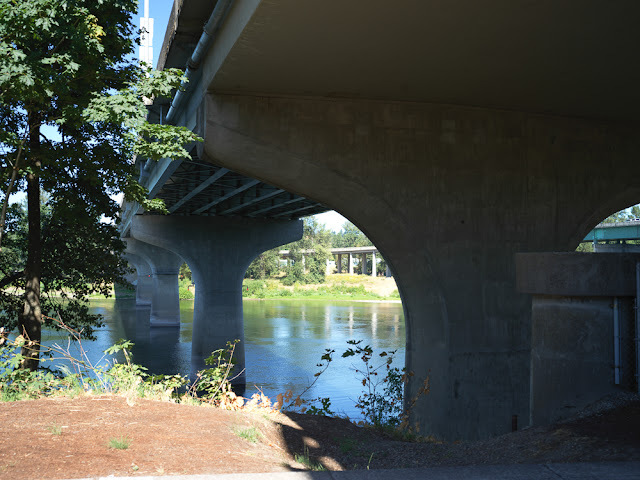 The new bridge switches from steel girders to a concrete slabs at the approaches. Perhaps these were part of the approach that was built in 1953. We can see an old abandoned support in front of the new bent in the photo above.